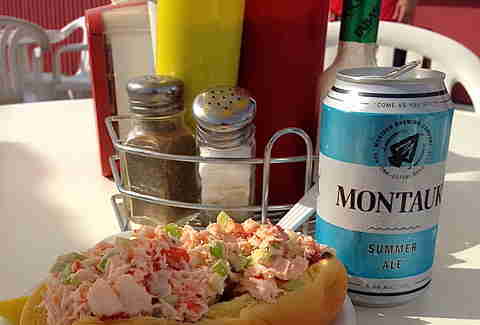 Nothing tops the feeling of enjoying the sun en route to Montauk outside Clam Bar on the Napeague Stretch... except for the taste of their lobster roll. Clam Bar’s seafood is delivered fresh from the local fishermen each morning, and despite being named after a slightly smaller and easier-to-crack sea critter, lobster is king here. The Clam Bar’s generously appointed roll is not overpowered by extras, just perfectly complemented with a light amount of mayonnaise and celery to give the meat a bit of a crunch, plus a soft, simply toasted bun. On the side of the highway on the Napeague Stretch you’ll find such a fantastic lobster roll joint that they get away with a stunningly simple moniker: Lobster Roll Restaurant. Founded 49 years ago, and more commonly known as Lunch, LRR is credited with creating what we now know to be our beloved cold lobster salad. Uniquely, Lunch offers two types of lobster rolls, and when you order they’ll ask if you’d like your sandwich cold or hot. 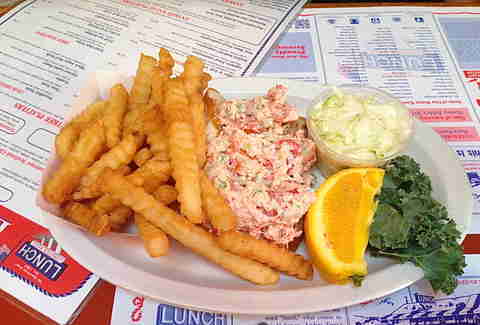 The traditional cold lobster salad roll option is mayonnaise-based with a celery crunch and served on a buttery toasted bun. 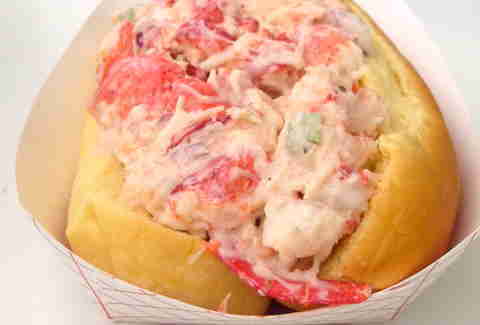 As it tends to cool down further out East, don’t shy away from their specialty -- the hot lobster roll -- a butter-based sandwich with only whole pieces of steamed lobster to pile onto a toasted bun served on the side. Both dishes are served with crispy, golden-brown French fries, homemade coleslaw, and an orange. Walking around bustling Southampton, you can forget that the ocean is even nearby -- but eat at Silver’s and you’ll quickly be reminded. The furthest out from the freshest fish in the Montauk Area, Silver’s is an underdog, proving that it can hold its own against the local beach cafés further out East and stepping up to the task with lobster from Braun Seafood Co. in Cutchogue. True to its character, Silver’s lobster roll is served on a French baguette, as opposed to the usual hot dog bun, which gives the sandwich a crisp and neat feel. The sandwich is prepared with very light mayonnaise, and a little bit of celery and a single slice of lettuce for crunch, making room for the huge, succulent, fresh chunks of lobster. In the small but central town of Wainscott, The Seafood Shop operates as a fresh fish market and kitchen, providing meats and produce to fire up on the grill at home and a tasty selection of prepared meals -- but the best deal in the house is their lobster roll. 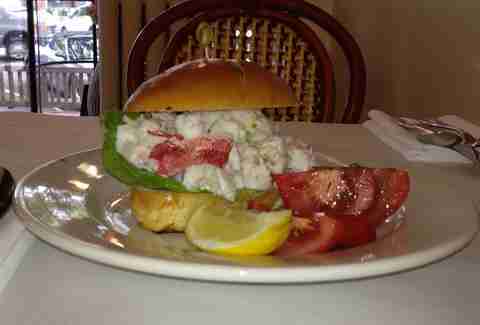 With their lobster salad running at $60.00 a pound, the $15.00 lobster roll is a steal. A generous portion of lobster, hints of celery and red onion, and a bit of garlicky seasoning all sit on a perfectly toasted bun, and it's no surprise that people line up to grab these on their way to the beach. 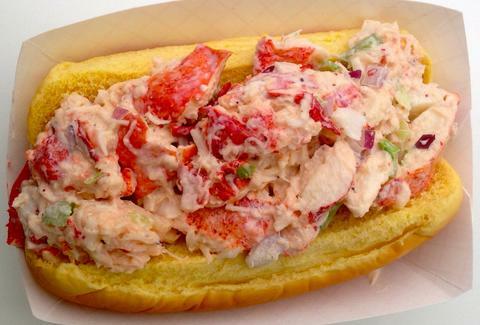 Nestled in the bay at the very end of Sag Harbor, amongst docks filled with million-dollar yachts and state-of-the-art sail and speed boats, is one of the Hamptons' most quintessential lobster rolls. Served on toasted hot dog buns, these rolls are in the no-frills business, letting the fresh quality of the meat speak for itself. 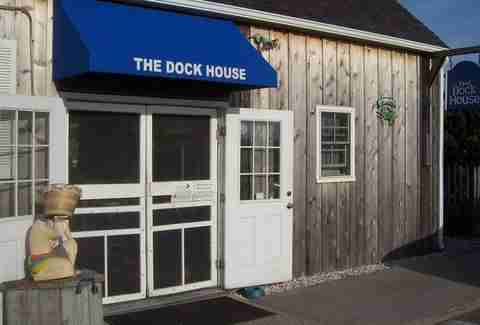 This low-key establishment is right on the water in a historic whaling community, offering not only the real deal when it comes to the taste of the lobster roll, but an authentic atmosphere as well. The staff is friendly and keeps the line moving quickly, which is an added plus on a hot day, not that this tasty treat wouldn’t be worth the wait.